Bridesupnorth.com is by far the North’s biggest and best wedding blog. Offering a portal to the very best in wedding services, from jewellery to clothing, venues, entertainment and more, it’s very much a destination for couples looking to create the celebration of their dreams. Brides Up North: Can you give us a brief overview of Lister Horsfall? gemma says: Lister Horsfall opened his Halifax jewellers back in 1902 – our proudly family-run Yorkshire business is still one of the crown jewels of the county’s top-end shopping experiences over 116 years later – and it’s this heritage, knowledge and experience passed on through generations, that brings customers to us when they want to mark a special moment in time with jewellery. You can find us in Halifax and Ilkley, and both stores offer our customers an inviting and comfortable environment in which to explore collections. 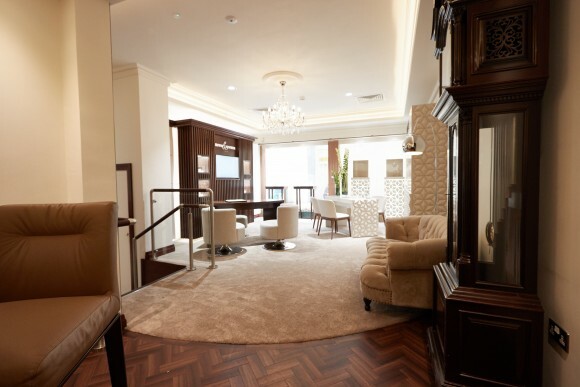 Our Halifax branch also houses our luxurious Bridal Suite, giving grooms and brides-to-be the perfect place to choose their engagement and wedding rings whilst enjoying complimentary drinks from our in-store bar. We stock a range of jewellery from the likes of FOPE, Mikimoto, Furrer Jacot, Messika, Ponte Vecchio, Brown & Newirth, FEU Diamonds, Diamond by Appointment and CARAT. These brands offer stunning ranges and if you’re looking for bridal jewellery, bridesmaids’ gifts or even something special for the mother-of-the-bride, you’ll find the perfect choice. In addition, we hold watches by Rolex, Tudor, Omega, Breitling, Tag Hauer, Longines and more, both new and pre-owned – which make for the perfect ‘for him’ gift if you want to mark an engagement or wedding with something memorable. How far in advance of the wedding should couples start to shop for their wedding rings? On average, couples start to choose their wedding rings about three months before the wedding. However, if you would like a bespoke set making, we’d advise starting the process about six months before – although we do cater for those quick turnaround moments where couples don’t want to wait before tying the knot, so we work with all kinds of timelines! What elements should couples take into account when shopping for their rings? We apply the same principles as shopping for an engagement ring when advising customers – agree your budget and perhaps have some thoughts on the styles you prefer. After all, we want our customers to enjoy such a special moment and feel comfortable with what they have spent so it doesn’t impact on their budget for the big day. As you will be shopping together, you may want to consider whether your bands will be plain or set with diamonds, or whether you’ll want them engraving. Other considerations are the durability of the metal you choose, and how it fits with your lifestyle. Equally, make sure that the wedding band will sit well with your engagement ring and not wear it away. As well as varying metals, what other choices do couples have in terms of the design of the ring? Wherever you shop there’s an array of choices on offer, wedding ring designs have come a long way in recent years and we’ve moved on from choosing between just plain bands or diamond set. You can choose between polished, matt and brushed effects, in a variety of metals, or select rings with mixed metals. And, if you want to go further on the finish, you could choose a more patterned ring, from a hammered effect or flat top, to a bevel or grooved one or even one with millgrain edges. In terms of diamond set, there are rings available that also incorporate patterned metals in addition to plain, so the choice is endless. Regarding width and depth of rings, often this is led by the shape of the engagement ring as we advise on selecting a ring that will fit well with it. For gents, it’s all down to personal taste and style, we haven’t spotted a trend preference in that area. Of course, some rings can bear an inscription that is personal to you, and our team can guide you through the ranges that offer this complimentary service. The other thing to note is that, despite the vast choice on offer, sometimes our couples want rings creating that are unique and personal to them, which is why we offer a bespoke design service. We make a lot of wedding rings and love working with couples to get the design that is perfect for them. Ultimately, whatever style, design or finish you choose, the only thing we say is to remember that you’ll be wearing it every day for the rest of your life! What style of wedding rings are proving popular with couples currently? We’ve seen a rise in rose gold styles and mixed metals, which is probably because so many couples are looking for something a little different and more individual to them within their peer groups. As ever though, platinum and palladian are popular, and we’d recommend choosing platinum due to its brightness in colour and as it is a hardier metal. What type of service can couples expect when shopping for their wedding rings at Lister Horsfall? Every customer is treated with the same respect and care here at Lister Horsfall, whether you are someone who has shopped with us before or it’s your first visit to us. We understand that it’s both an emotional and exciting time when someone is about to propose or get married, so we make sure that couples get the best experience to help them make their day as perfect as possible. We don’t see ring shopping as a ‘job to be done’, we believe it’s an occasion in its own right in the run up to a wedding or civil partnership and treat it as such. It’s why we created the bridal areas that we have in our stores – intimate settings where you can explore and try on the different ranges, seek advice and ring recommendations from our down-to-earth and experienced team, whilst relaxing and soaking up this special moment with complimentary champagne. How can you assist a bride-to-be in selecting the right jewellery for her big day? When a bride comes to us to select jewellery for her wedding day, we will talk about the colour and style of the dress, be it traditional, vintage, city-driven or boho-chic for example. This gives us a lead on the style of jewellery we would recommend to the bride, whilst also taking in to account her personal taste. The devil really is in the detail though, so we also take in to consideration the finer elements such as the neckline, sleeve length and bridal hairstyling, as this gives us guidance as to what we’d recommend for lengths of the necklace, weight of a bracelet or even whether to go for studs or drop earrings. From our experience, we know that pairing the right jewellery with a bridal outfit really does enhance the overall look and helps make the bride feel extra fabulous on one of the most important days of her life. Are you noticing any trends in bridal jewellery at the moment? Solitaire and diamond line necklaces and earrings always look stunning, especially when paired with simple, elegant styles and boho-chic looks. We are also seeing a resurgence in pearls as there are some fabulous designs out there, from houses such as MIKIMOTO, for brides who are looking to pair a statement piece of jewellery with a pared back outfit. What type of jewellery would you suggest for a bride wanting a traditional and elegant look? For traditional and elegant, we would suggest a solitaire or diamond-line necklace and matching earrings, perhaps with a diamond line bracelet. They are timeless classics and can take you beyond your wedding day for all manner of occasions; they are very much an investment that will be packed full of wonderful memories and can be passed down through generations. And what type of jewellery would you suggest for a bride wanting something that bit different? If you’re looking to bring a bit of colour in to your look, we have a stunning range of diamond and coloured stone pendants and sets from the likes of FEU Diamonds. Or, if it is a more modern take you’re after, CARAT offer a fantastic range of jewellery in cubic zirconia, which makes it more accessible for brides with a budget in mind without compromising on their look. 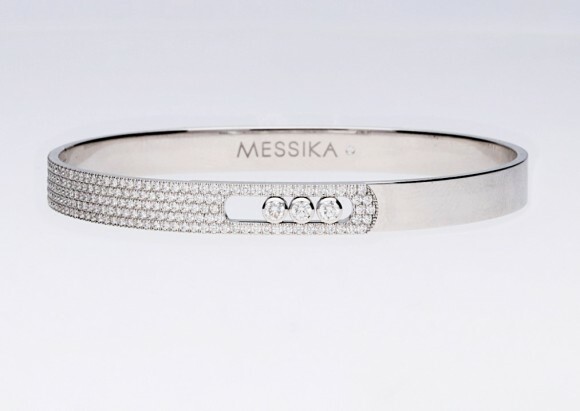 Messika offers a wonderful range, of which their Move collection looks fabulous on brides, and is exceptionally well made, elegant but with a modern, dynamic edge. For something even more noticeable, then the stunning World of Creativity SPLASH earrings and pendant set from MIKIMOTO is an exceptional modern take on traditional jewellery as it features pearls and diamonds. It’s definitely a set for a bride wanting to make a statement! How can our readers find out more about Lister Horsfall or get in touch? You can visit, call or email us at either of our stores, where we are open 10am until 5pm, Monday to Saturday. We are offering Brides Up North readers a fabulous offer up until 30th November 2018: buy a wedding ring set from us and receive a free pair of pearl earrings worth £100*. Simply mention this Brides Up North blog post and offer to us in-store and we’ll do the rest. The groom: A watch is always a fantastic gift as it marks the special moment in time and can be worn every day. From Rolex and Omega to Breitling and TAG Heuer, we have ranges for all budgets. The bride: Diamond studs, again theses are a great choice if you want something that will be worn beyond the day and are available to fit a range of budgets. Mother of the bride/groom: Pearl earrings are a super option for mums, as they’re versatile and can be dressed up or down, so you know you’re buying a gift that will be worn again and again. If you’d like to read more from Gemma, you can visit the Brides Up North blog here.